Disclosure: This post is in partnership with NUK. As always, opinions are all mine. Preparing for baby number eight has me quite excited! Although, the thought of breastfeeding a new little infant again makes me a little nervous! However, I’m not as frazzled as I probably would be because dad will be home this time around to help me as I’ll be nursing a newborn and having to deal with seven other kids at the same time! Although I do breastfeed exclusively, I am excited to add the NUK® Simply Natural™ Freemie® Collection Cups to my pumping bag (just in case)! You never know when something will come up and dad will be required to feed the little one. Being able to pump on my terms, comfortably and effortlessly is something I am looking forward to, the odd time I may need to pump. I know at the hospital when I give birth I will be bringing my pump because baby girl may be born with low blood sugar due to my gestational diabetes. Knowing this, I want to be prepared and instead of having to supplement with formula, I can pump some extra colostrum to ensure she gets as much as she needs to help her blood sugar rise and stay up along with normal nursing! Pumping at the hospital isn’t necessarily ideal or comfortable, so anything I can do to make it more comfortable for myself to allow more colostrum to flow, I will do! That is why I will have the NUK Simply Natural Freemie Collection Cups with me in my hospital bag! Fits Snugly Under Bra: Simply Natural Collection Cups feature a concealable, hands-free design. No pumping bra required. Easy to Use: Moms can easily place the cups inside their bra and connect to a pump, pump directly into the cups, then pour into storage containers. Two 8 oz. collection cups fit discreetly, allowing moms to pump up to 16 oz. at once. Compatible with Leading Double Electric Breast Pumps: NUK, Hygeia, and Medela Pump In Style®, are all compatible with Simply Natural Freemie Collection Cups. Kits are sold separately for several other brands at freemie.com. Part of the Simply Natural System: Simply Natural Freemie Collection Cups are part of the Simply Natural Feeding Support System, a line of innovative products designed to make natural feeding simpler so that mom can maintain the bond with her baby. The line also includes the Simply Natural Bottles – providing a more natural feeding experience and designed to be closest to mom’s breast. For me, nursing is very natural, and I have no problems doing it whenever and wherever. However, I need to have a small procedure done shortly after the baby is born and I cannot bring her along with me. I am excited to be able to pump comfortably with the NUK® Simply Natural™ Freemie® Collection Cups while I’m away. I am not the biggest fan of the pumping process, but I like that I’ll be able to pump by simply placing these cups inside my bra rather than having to sit still in one place with big giant bottles attached. 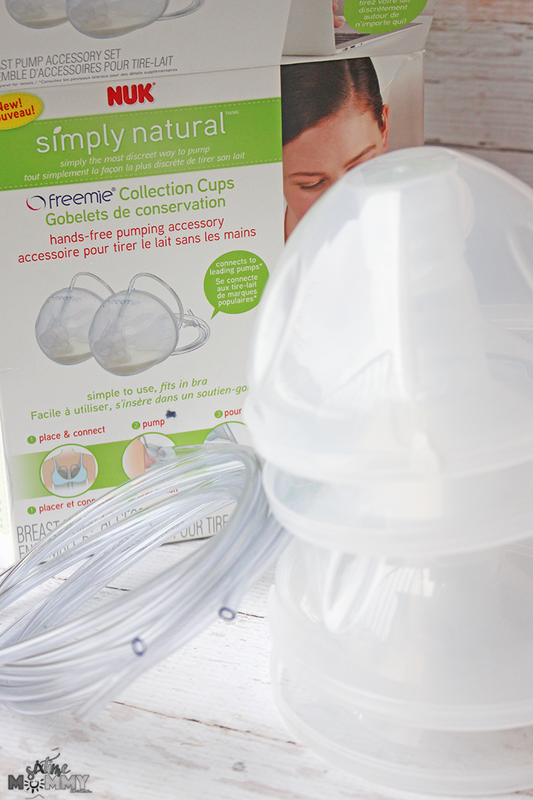 I was also thrilled to see that the NUK Simply Natural Freemie Collection Cups are compatible with leading breast pumps, including mine, so I don’t have to go out and buy a new pump. One of the most significant challenges moms face while breastfeeding is finding a convenient way to pump. Moms often struggle with hanging bottles, as well as the unease of feeling exposed. To combat this inconvenience, the NUK Simply Natural Freemie Collection Cups are a discreet pumping accessory that allows moms to pump hands-free, under their clothes. If you are one who wants to pump without the hassle, then these cups are a great option for you!